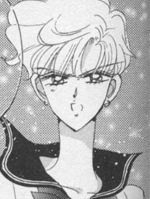 In the manga Hotaru is a male and female (I think, that's what it says) and Michiru is his (/her) girlfriend. Haruka transfered from Crossroads High School to Infinity College and is a sophmore. She is always with Michiru. They are as one. They are bound together strongly. She believes in Michiru and will only listen to her. She plays piano accompaniment to Michiru's violin.